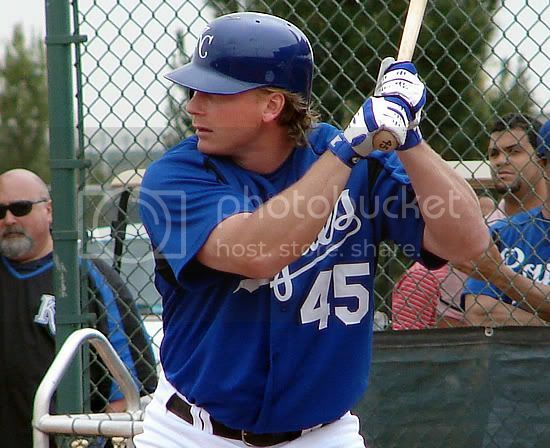 Mark Teahen's next swings will be taken for the Omaha Royals. After a meeting yesterday between Allard Baird, David Glass, and Buddy Bell, the Royals today announced a series of moves. Mark Teahen, who has looked completely lost at the plate for most of the season, has been optioned to Omaha, and Esteban German will take his place as the primary third baseman. Taking Teahen's spot on the roster will be Aaron Guiel, whose promotion seemed to be necessitated by Reggie Sanders' hamstring injury. And finally, Joe Mays has been removed in the rotation, and Baird anticipates his replacement will be announced tomorrow. RC's money is on Mike Wood, but Jimmy Gobble has also thrown well lately and may get another crack at the rotation. Mays has been asked to accept an option to the minors, and if he refuses, RC believes he will probably be released. RC's initial take on the moves is positive. 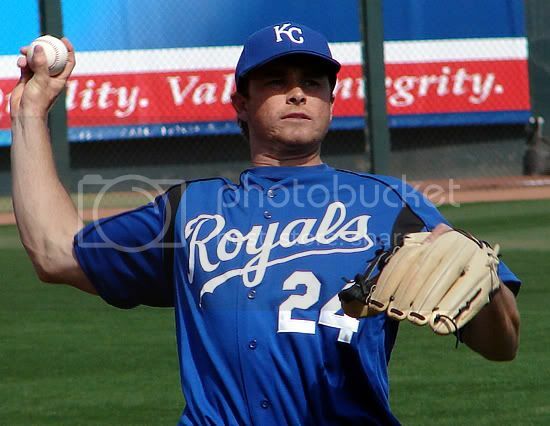 Teahen has been playing terrible baseball for a while now, so hopefully his demotion will get him on track. It will be nice to see German get more at bats and less playing time in the outfield, and Guiel's promotion was probably overdue. RC is in favor of anything that causes Kerry Robinson to get less at bats, and this figures to accomplish that. And of course, Mays' removal from the rotation was absolutely the right move. 100% agree with every move. I HOPE that Guiel gets a lot of playing time in place of Brown WHEN we get some more of our outfielders healthy. German getting more playing time is good, and Teahen not being here is good by me too, everyone knows that 3B is Gordon's job for the future..let's end the charade on that. Also, no more Joe Mays....does anyone disagree with this?? LOL..didn't think so. What happened to the plate discipline Teahen had? It seems like when people move to KC, they forget how to walk. I'm thinking it's a coach or team-set mindset or something. If it was the batting coach, then Teahen didn't escape it for long. The coach is down in the minors, and so too is Teahen, now. In any event, here's hoping Teahen finds a way to get speedily back to KC. Its a good start. Now it will be interesting to see if Brown or Guiel get sent down when Costa and DeJesus come off the DL (I assume Robinson will be one of the outfielders sent down). Next Bell needs to insert German into the leadoff spot. Robinson can hit in the 9 hole. We just have to find someone to hit in the 3 hole and get Mientkiewicz out of that spot and further down the order. It sure is nice to be on a winning streak for a change. Burgos has to be the All-Star right now, and it's not even really close. Dessens would be a candidate, but it seems like the only time a middle reliever gets the nod is when his manager is the one doing the selecting. what did kerry robinson do, kill your dog? because he is hitting 320 primarily in lead off duty. usually, i agree with your assessment, but i will take .320 on this team any day of the week. AJB, it's less about what Robinson does, and more about what Robinson is: a completely inept offensive baseball player. Sooner or later, his lack of talent is going to catch up to him. well, i'll take otherwise "mediocre" AAA players who show tenacty and the willingness to win. in all, we're in bad shape, teahen is no good considering german's ability in the infield. does teahen have any trade value? it should be looked for b/c german and especially gordon can play 3B. teahen as well as berroa have worn out there welcome. Kevin nailed it. Look, I think it's great that Robinson is playing well, and I cheer for him to get a hit every time he's at the plate. But the fact is that Robinson is not a quality option, and time will prove that to be the case, just as it has over the course of his 4600 prior professional at bats. As long as Kerry Robinson is hitting for average and getting on base, I see no problem with him hitting leadoff. Bell will just have to recognize if/when he begins to struggle and move him to the 9-hole/bench promptly. Why no stats yet from Teahen in Omaha? Shouldn't he have at least made the game by Sunday...or Saturday even? Oh yeah..and can we add Teahen to the prospect list? Or is he officially done? I know he played last year in the majors...but I think he still has some promise. A lot of times when a player who's been in the Majors for a while gets sent to the minors, the club gives him a couple of days to report, to relax and clear his head. That's probably why Teahen hasn't played yet. And no, Teahen won't be included on the prospect report, for the same reason Gotay isn't -- because he's had so many at bats in the Majors. Teahen was never exceptional at getting walks; Because of being part of the Billy Beane Moneyball draft many think that. Truth is the the best he ever did in BB/K ratio was his brief soiree in AA Midland shortly before being dealt to KC. I don't get why we're already giving up on Teahen, not that I'm a huge fan, but why not give him a full season to sink or swim? What do you have to lose? I believe Bautista is taking Mays' spot in the rotation, he's starting Monday.